Pay a visit to our beautiful Craft and Design Shop where shoppers of all ages and budgets will find a special reminder of their visit to Connemara or a precious gift to bring home to someone they love. 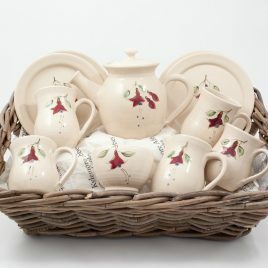 Our fuchsia range of pottery is made at our onsite pottery studio and available exclusively at Kylemore Abbey. Pick up a piece of Kylemore Pottery when you visit as a lasting memento of your visit to Kylemore Abbey. The pottery produced is crafted using time honoured, traditional techniques and can be purchased in the onsite craft and design shop in Kylemore, County Galway.